We know what it looks like. Really. We do. We skydivers look completely nuts. And videos like these don’t help, now do they? It’s easy to get the wrong idea though when you look at skydiving from an external viewpoint. We’re all hanging on to the outside of some airplane, cruising miles over the landscape, grinning and making silly faces at each other before we peace out into the big, blue sky with ear-to-ear grins. You just gotta think: Man. Those people have got to be nuts. At what point are they going to realize that enjoying a two-mile plummet is a really good reason to get stuffed into a straitjacket? People who don’t skydive often imagine that skydiving feels like a roller coaster ride. Guess what? Totally not a thing. First of all: roller coasters aren’t even comfortable. They’re all made of jerky hard metal, bouncing around and trying to crash your poor little head into the weird little metal-bar-seatbelt-thing. You might be totally into them, but, speaking for ourselves, we’re always kinda glad when the ride is over. On the other hand, we are never happy when a skydive is over! Skydiving feels so smooth and sweet in comparison, performed in equipment that fits comfortably. It feels so much more secure — not to mention a heck of a lot softer — than a roller coaster seat. Most importantly, it’s not a one-size-fits-all kinda fun. You can customize the experience! Just ask your instructor for more or less excitement. Your tandem instructor is there to optimize your experience, not simply to jangle the harness to make sure it sticks and send you on your way. At the speeds we move, you won’t have either. You’ll be moving at airplane speeds until you’re moving at freefall speeds, so you’ll always have the sense that you’re standing in front of a giant fan. In the wide-open sky, you won’t be falling past any visual references. Because there aren’t still points around you — like trees next to a road — your brain has nothing available to calculate the speed. (If you pass a cloud, however… you’ll notice.) Boom! Freefall freedom! NOT kicking-and-flailing freak out. The falling feeling is so conspicuously absent, in fact, that we have to wear precision instruments on every single jump to help us keep track of our actual altitude at any given moment. Once you start skydiving, you can’t help but bond with other like-minded people. 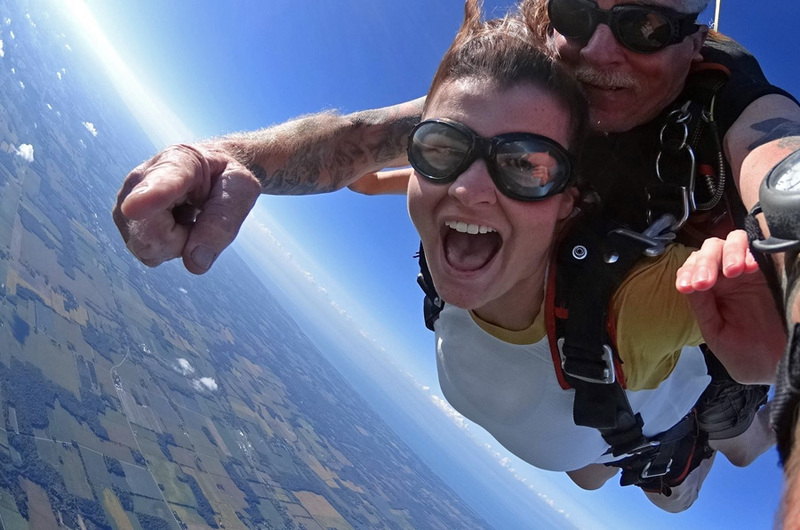 On your very first day at WNY Skydiving, you’ll immediately recognize that skydiving is a sport full of open-minded, open-hearted, open-armed folks who share goals and values. Once you step into the world of skydiving, you join the family. It doesn’t seem so crazy now, does it? I mean — sure, we’re nuts, but in a good way. When you meet us, you’ll see!